A Pillow Pet will make the perfect gift for an artistic child. If you want to buy something unique, opt for Pillow Pals. Similar to the hugely popular Pillow Pets, this service prints a copy of your child’s artwork directly onto a pillow to create a wonderful keepsake. 3D printers were once reserved for scientists and government agencies, but the latest desktop models are available at a much more reasonable price. A 3D printer can print any object you like using blueprints available online. Although they are still an expensive gift for children, you will probably have just as much fun with it yourself. The horsey bicycle is the perfect gift for every little girl that ever dreamed of getting a pony for Christmas. Designed by Eungi Kim and shortlisted for the 2010 Designboom competition, the horsey bicycle is an attachment that fits onto a regular bike that looks as though the rider is sitting on their very own stallion. It is not available for purchase just yet, but you could always have a go at creating your own. This gift idea is perfect for your newborn baby. If you can knit and you have free time, why not knit a cute sweater for your little one? There are many free knitting patterns online, but I think a knitted snowflake sweater is the most beautiful one. Plus, it’s a great budget-friendly Christmas gift. If you want to get your child interested in literature early on, then check out the amazing books available online. All of the literary classics are available in easy-to-read formats complete with charming illustrations for toddlers. Choose from classics such as Pride and Prejudice, Wuthering Heights, and Frankenstein. Wendy houses are still awesome toys for kids, but a Hobbit’s house will certainly score you more points. Wooden Wonders offer a spectacular Hobbit’s den complete with wooden interior that your children will adore. From $1500, they are slightly expensive, but at least it’ll get your kids playing outside. A personalised book that uses your child as one of the characters in the story is a wonderful gift that is also a great way to encourage your child to read. There are many different online retailers that offer personalised books featuring fairy tales, adventure stories or classic tales such as Peter Pan. The Thing is an excellent gift for older children and particularly those enrolled in art school. For a yearly subscription fee, your child will receive a mystery work of art every three months designed by artists such as Ben Marcus, Mike Mills and James Franco. Previous things include pillows, shower curtains, clocks and cutting boards. If your kid enjoys taking selfies and uploading them onto Facebook, then a novelty toaster that burns their face onto toast may be just the thing for them. Burnt Impressions is an American company that offer the novelty toasters for just $69. You only need to upload a clear photo to their website and they take care of the rest. The Sbyke is the perfect gift for the child that has everything. A cross between a bike and a scooter, the Sbyke may look weird at first but enables your child (or possibly you) to perform amazing tricks and jumps once they get the hang of it. 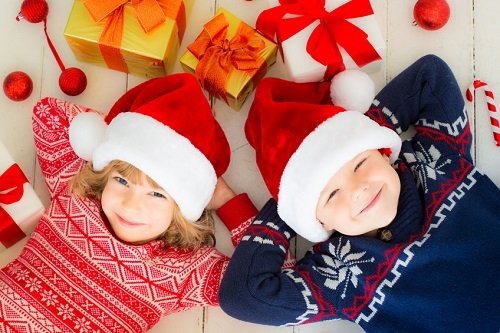 Rather than spending hundreds on the latest toy crazes, purchasing one or two quality gifts will keep your child happy and entertained for much longer. Thanks to the Internet, Christmas shopping is no longer a difficult task as almost every item is available online. Just be sure to order your gifts well in advance to avoid disappointment on Christmas morning.